Got a new Android phone? Or, planning to purchase one? Here is how to kick it off. Are you going to jump into the world of Android? Here is a guide on how to get a great start with your shiny new Android smartphone. Currently, Android is the mostly used mobile operating system throughout the world. The OS is being developed and maintained by Google, you know. The web giant has been doing a great thing with the ease and eminence of the overall Android ecosystem. Being free and open source, the operating system is the number one preference of many OEM companies. Device manufacturers enjoy a moderate independence on customizing the UI and functionalities of the software. However, the core Android experience is almost same. So I hope, this post will be applicable for most of the Android gadgets. Let’s start. If the smartphone is just unpacked from a sealed box, probably its battery is charged enough to power it on. Or if you’ve gotten it from one of your family members as a hand-me-down reset phone, make sure it has enough juice to power the setup. Start with SIM card inserted inside it and having it fully charged. Your Android phone comes with a host of languages. Choose your desired one from the welcome screen. However this order may vary from manufacturer to manufacturer, because I’ve already mentioned that device makers got the freedom to customize the OS up to a certain extent. You can also change the phone language from ‘Language and Input’ section in Settings menu. In this age of cloud computing, an internet connection is vital to setup any smartphone completely. That’s why you will get an option for connecting the device to Wi-Fi. The phone will search and show the available connections. Tap on the appropriate network to connect. You can skip this step though, but probably then you are going to choose your mobile data to use the internet. Adding a Google account is one of the most important steps to setup an Android smartphone (or tablet). The system will ask you if you ‘Got Google’. Tap ‘Yes’ to sign in with an existing gmail account. Or press ‘No’ to create one. Once you’ve successfully connected your phone with Google, it will show the fabulous world of Android. You will be able to download apps from Google Play Store and use other services offered by the company. You can synchronize your Android’s settings, contacts, photos, apps and other contents to your Google account. It will let you install apps from your computer without touching the phone. Just visit the play store from your computer while staying signed-in from the same gmail account. Explore through apps and click the ‘Install’ button on your desktop browser. The app will be installed automatically into your phone. After adding the Google account, check for updates to your device apps and firmware. Install the latest bunch of developments before starting further customization. It should help you to get a smoother experience. Your phone will also notify you if an update is available. Or you can manually check for updates by going Settings > About Phone (or Device) > Software Update. Check and download updates for Android from here. You can set it to download and install all future updates automatically with more options. Another important part of the update mechanism is to check for app updates in the Google Play Store. Open the Play Store, go to its menu by tapping the three-lines on top left and go to My Apps. It will show a list of your all applications with update status. If you are switching from another smartphone, probably you have backed up your contacts, photos, calendars etc. There are many third party programs to transfer contents between smartphones. You can use Wondershare MobileTrans to do it easily. Google has Android File Transfer program only for Mac which helps to transfer files between Mac computer and Android device. Windows users can connect the phone to the computer via USB cable to transfer photos, music, videos etc. You can also import contacts from single contact card files or.csv documents. Once the update and content loading is complete, now it’s time to get necessary apps. Visit the Play Store to browse and install utilities such as media players, email apps, note taking tools, communication apps, social media clients, cloud storage apps, web browsers and much more. After installing apps, it’s time to customize your Android experience. Adjust the sound volume including call and other alert options, set your favorite wallpaper, fine-tune display brightness and other UI features. You can install keyboard apps to type your own way. Also customize Google apps such as Drive, Google+, Google search (including Google Now), Hangouts, Photos, Play Music, Play Newsstand, Play Games, Chrome, Gmail and Voice Search. Android offers a range of security tools to protect your device. At first lock your phone with its screen lock features. Go to Settings > Security > Screen Lock and set a password or define a pattern to lock the phone’s door. Use Google’s Android Device Manager app to track and find the phone in case it is lost or stolen. Keep backups of your contacts, photos, apps and other stuffs regularly. In the Settings menu, you will find more safety settings under Security section. Use them to tighten your mobile security. In newer version (Lollipop) you can create multiple user accounts so that each of your family members can get their own customized environment. Basically, this is a brief guideline regarding how to start with a new Android phone. I hope you will find it useful while beginning your Android life. Please share your thoughts via comments. Thanks. What to Do Before Giving Away or Selling Your Phone? 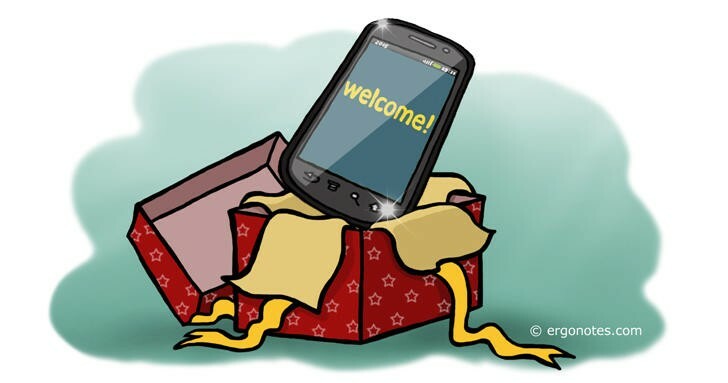 « What to Do Before Giving Away or Selling Your Phone? » Bluesmart: Blue Smart Suitcases?